Could combining the two roles offer your company a competitive advantage? Let’s face it: Everything moves on green. As Wall Street demands deeper knowledge about a company’s financials and critical evaluation metrics, the steward of a company’s relationship with analysts and investors must be extremely astute about all matters related to the company’s cash position and risk guardrails. As a result, some organizations have recently begun adding a new position that’s essentially a hybrid of the IR role and the treasury role. The result is a company representative who can provide both a finance executive’s acumen and an IRO’s expertise. According to data from NIRI, nearly 90 hybrid IR/treasury positions currently exist in more than 20 industries, with the industrials/manufacturing and technology industries employing the largest share. Marty Ketelaar, a certified public accountant who also attended an investor relations executive education program in 2004, was hired as vice president of investor relations at window and door components manufacturer Quanex Building Products in 2012. He became its treasurer and vice president of investor relations about a year later. Several factors seem to have prompted organizations to combine the roles. The global economy has become so interlocked that what happens elsewhere affects the US economy; as a result, there is an expectation that an IRO will have deep financial acumen. 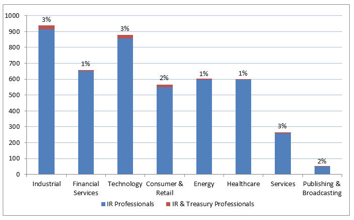 The recession also played a part: 84 percent of financial professionals say the treasury function now is a more strategic role at their organization, according to an Association for Financial Professionals survey; nearly two thirds (69 percent) feel that’s due to an increased emphasis on liquidity and cash management. Dealing with an IR professional who is also heavily involved in the company’s treasury department may also help sooth equity holders’ risk concerns. ‘In a highly leveraged – or even just leveraged – company, it’s a piece of the puzzle that just gives the IR person a lot more credibility,’ says Melissa Plaisance, senior vice president of finance and investor relations at food and drug retailer Safeway. Plaisance began her career in the banking industry, was hired as Safeway’s director of investor relations, and now oversees treasury, IR and strategic development. In the next five to seven years, the combined role will transform into an even broader, more financially focused function. This shift could potentially provide expanded career development and employee retention opportunities. Management would, in theory, be able to make better-informed decisions about the issues that affect how the company is viewed by investors and analysts. In turn, IR/treasury professionals could start advancing to oversee other critical functions –including, according to Ketelaar, organizations moving corporate strategy planning duties into the IR/treasury role. Click here to view the full IR Magazine article.